Advocating on behalf of our members is one of the most important and valuable services a trade association like BOMA/Chicago provides. Our members clearly look to us to be the voice for commercial real estate in the City of Chicago. To some, that may conjure up images of impassioned testimony before legislative committees or mobilizing members for a call-to-action. While these images are sometimes true, meeting the advocacy goals of a premier trade association on a daily basis often looks very different. The strength and consistency of BOMA/Chicago’s advocacy efforts not only lies within our organizational reputation as the voice of Chicago’s office building community – our success is also a direct result of our strong and deep-seated partnerships with City officials. BOMA/Chicago regularly meets with City department heads in a continued dialogue on matters of mutual interest. Whether it concerns fire and life safety, codes or taxation, ongoing relationships with City officials allows us to share best practices, industry insights and emerging trends for better public policy outcomes. BOMA/Chicago is also often the “institutional knowledge” for newly appointed officials who need to quickly get up to speed. Our collaboration with the Department of Buildings is a strong example of BOMA/Chicago’s long history of productive and results-driven relationships with city officials. BOMA/Chicago recently met with Felicia Davis, who was appointed by Mayor Rahm Emanuel to be the City’s new Building Commissioner. In fact, BOMA/Chicago has worked closely with many of the previous building commissioners. Commissioner Davis’ predecessor, Michael Merchant, partnered with BOMA/Chicago to institutionalize the Buildings Advisory Committee and sought our input on framing the argument for the adoption of the International Building Code in Chicago. Merchant’s predecessor, Richard Monocchio, found BOMA/Chicago to be invaluable when crafting the City’s Elevator Annual Inspection Certification program. Additionally, BOMA/Chicago, as a member of the Chicago Public Private Task Force, meets monthly with Gary Schenkel, the Executive Director of the Office of Emergency Management and Communication to discuss emergency operations, special events, preparedness policies and their impact on member buildings. We are currently involved with Chicago Department of Transportation (CDOT) officials on transportation issues, the Mayor’s office on energy issues and the Fire Commissioner on fire and life safety training issues. BOMA/Chicago also works closely with the Chicago Film Office to coordinate information about movie and television production in the central business district and provide input on building accessibility issues to the Mayor’s Office of Persons with Disabilities. BOMA/Chicago’s relationships with government officials do not only extend to the City, but to the State as well. Last week, BOMA/Chicago President, George Kohl, Executive Vice President, Michael Cornicelli and I were on hand to greet Governor Pat Quinn at a reception being hosted in his honor. The Governor has been very supportive of both BOMA/Chicago’s work on energy and our position on energy related legislation. Last year, the Governor appointed Cornicelli to represent the interests of commercial real estate on the Smart Grid Advisory Council. The meeting gave BOMA/Chicago a chance to brief the Governor about the BOMA Chicago Energy Center’s current Smart Grid Initiative and discuss a few issues likely to be addressed by the Illinois General Assembly during the current legislative session. While maintaining these ongoing relationships and continued dialogue with City officials might seem to be a mundane exercise, it is important to remember that all of these agencies can directly impact commercial real estate. When officials have an understanding of the impact and cost that policies can have, it is much easier to find common ground on policy matters. Michael Cornicelli speaking at the 2013 Annual Meeting. Worked with state legislators to ensure that building owners and managers retained the right to determine concealed carry policies for their own buildings. Lead a consortium of local real estate organizations aligned with the City of Chicago in which we defeated the attempt of the State Fire Marshal to require the costly installation of fire sprinklers in all high-rise buildings. Will take a stance on the Divvy bike program and make it clear that we will forbid policy advocates who lack commercial real estate experience from passing laws that negatively impact our buildings and disregard private property rights. 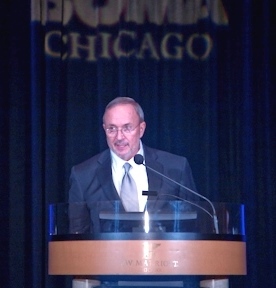 BOMA/Chicago looks forward to once again living up to our reputation as the voice of Chicago’s office building community in 2014. What issues do you foresee affecting the CRE industry this year and how can BOMA/Chicago better serve your advocacy needs? Leave us a comment below.